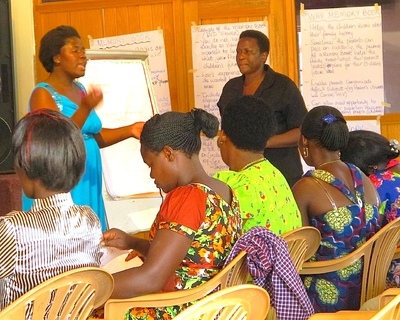 Lois Pollock writes: Savings groups are common in communities across Uganda. 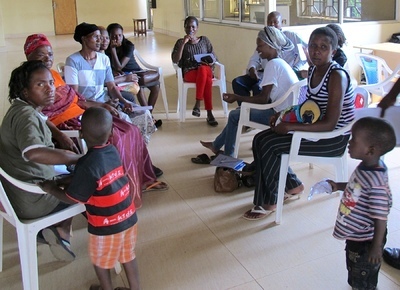 They are often started by women who are desperate to find ways of saving money to pay for school fees; cover medical expenses; provide essentials for their children. Every time I visit Uganda, I am conscious of just how difficult it is to keep a track of the money in my purse. Most local residents do not have bank accounts, or access to savings. Every shilling they earn is spent out on transport, food, and the daily costs of living. In many groups I have worked with over the years, individuals have little idea of what their weekly income is, or what their real outgoings are. They don't have any notion of the value of the assets they have (maybe a piece of land, some goats or chickens or perhaps a cow). 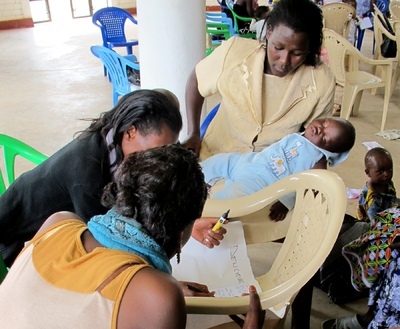 Several years ago, TASO had a program to help HIV+ groups develop small sustainable income-generating projects. Many of these failed because the participants were not keeping any records and had little idea how to begin saving. 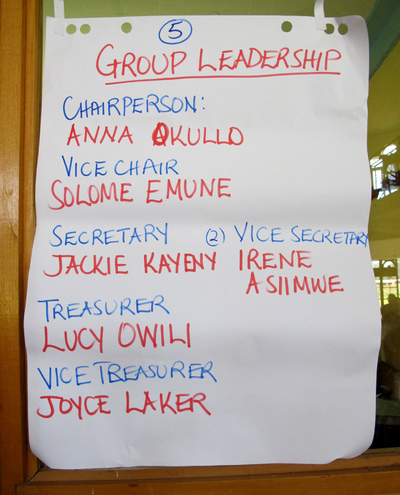 It was in that context that I began work with an HIV+ group of men and women in Najerre outside Mukono. 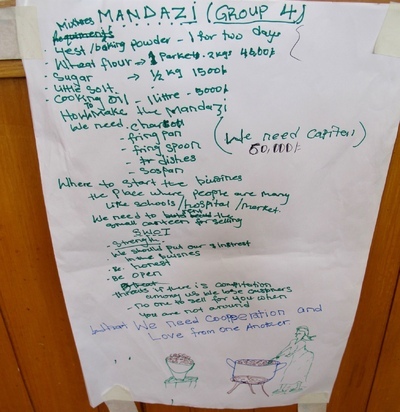 In fact, this group had already been given some training in how to begin a village savings scheme and each member pledged to save a few hundred shillings (very approximately £1 = 4,000 shillings) each week. The collective savings could not be touched for three months. After that, if a member needed a loan, they could ask to borrow twice the sum of the money they had saved - to be repaid within three months and with interest added at a low rate. There were many pitfalls in this kind of scheme: some of the members simply defaulted on the loan and there was no recourse to get the money back into the savings scheme. A few members sadly became very unwell and died. In discussion with the group, it was decided that the constitution already in place was adequate. But it needed to be fully complied with. 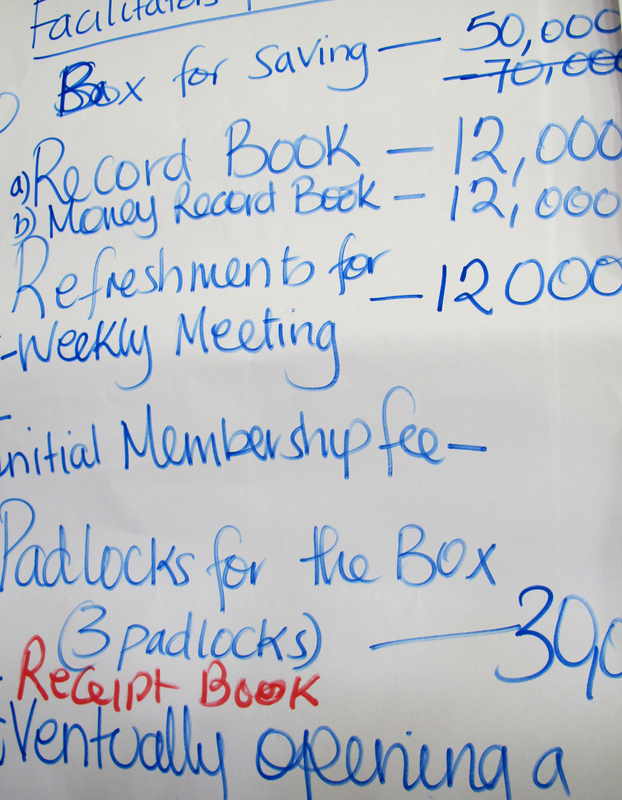 The membership needed to be increased from about 12 people to a minimum of 30. The group needed to meet on a regular fortnightly basis, to confirm that every member had paid in the required dues, that any loans due for repayment were being repaid, and to give consideration to saving collectively for a longer period than three months before any loans would be paid out. A percentage would be put into a general savings fund and at the end of a year, the group might decide to develop a further, collective, sustainable income generating project. Within that group in Najerre there was one woman skilled in bead-work. She was saving regularly and selling her products on a fairly regular basis. In fact I bought a number of her beads as small gifts to take back to my colleagues at work (then in Australia). I paid her fairtrade prices for her craft - little enough for her skilled work, but well above the amount she was selling them for in a Kampala craft market. 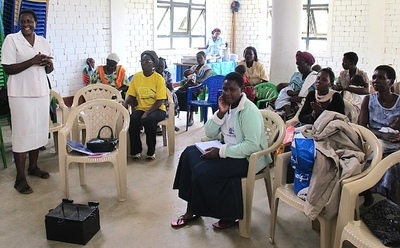 I suggested that since she was part of the savings group and used that as a marketing ploy, perhaps she should pay a percentage of sales revenue back into the general income of the savings group. A year later I returned to this group. They had taken on board all of the previous training. They had increased their membership; were strict about the weekly amounts each member paid in; and their general savings pool had enabled them to buy a sow and a boar, and build a local pig pen on land that one of the members owned. You can see some photos of the pig project here. Local farmers were paying for their sows to be impregnated by the boar and when their sow produced a litter, each farmer gave one piglet back to the savings group project. As the pig stock increased, the savings group were distributing the piglets to members who wanted to begin their own pig project. This is an example of the way that savings groups can not only aid individuals, but inspire community-wide cooperation and ambition. Women-only savings can also be radically transformative in a country where money traditionally is controlled be men. 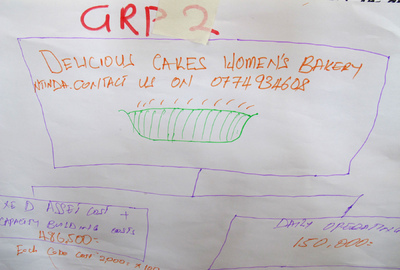 You can read about a Kampala-based HIV+ women's savings group here.